Autumn is approaching, and so is the opportunity for fun fall accessories. Baltic amber, which comes in a variety of yellow and orange hues, is a severely underrated way to adorn yourself for the season. 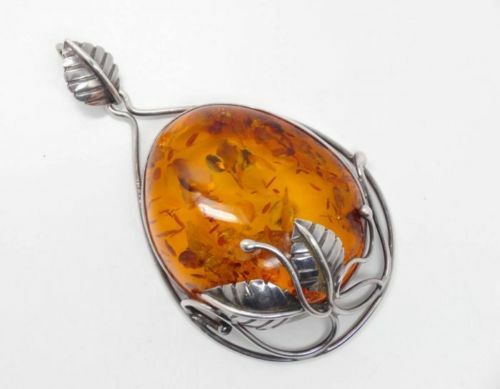 Though it does appear to be a gemstone, all real amber is actually fossilized trees. Baltic amber is amber that has been mined from near the Baltic Sea. 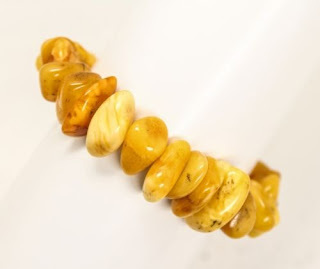 Baltic Amber has also been said to help with pain relief, inflammation reduction, and energy restoration. In Europe, Baltic amber is commonly known as "teething jewelry," due to its pain-relieving properties. It also is said to help with joint pain when worn near the site of pain. A fisherman named Kastytis chose to cast his nets near Jurate's amber palace, so Jurate set her servants to tell Kastytis that fishing there was forbidden. Kastytis kept fishing anyway, so Jurate went to confront him herself. When he heard that his daughter was living with a mortal, Perkunas was furious. In his anger, he destroyed the amber palace by sending a lightning bolt into it, which killed Kastytis. Jurate remained chained to the palace's ruins for all eternity. It is said now that when there is a storm in the Baltic Sea, pieces of Jurate's amber palace wash up on shore. Some pieces are teardrop shaped -they are said to be Jurate's tears from crying for her lost love.